We used the Solexx product to replace the roof panels on a gazebo. The original plastic panels failed after 3 years and replacement panels from the manufacturer were very expensive, plus we were looking at replacing them again in 3 years. We saw Solexx at a local garden show and it seemed like an alternative solution. We were able to buy the 5mm product nearby and it was very easy to cut and install it on the gazebo roof. May not be the use intended for the product, but it sure worked great, and comparatively for minimal cost. Also the local staff was very informative, helpful and courteous. A great experience all around. We are looking forward to the gazebo roof lasting for at least 10 years! Thank you Solexx! 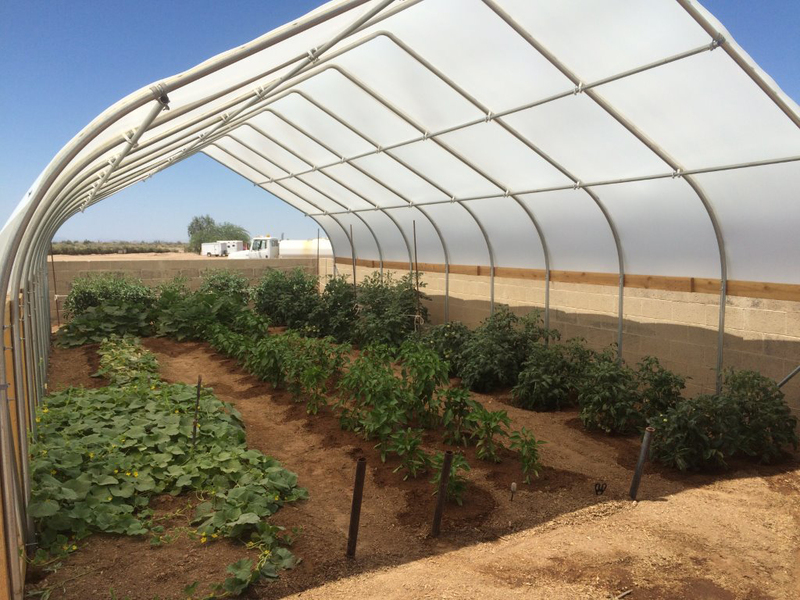 The John Volken Academy used Solexx to create this high tunnel greenhouse to grow food. The John Volken Academy is a long-term residential drug and alcohol treatment center for young men and women aged 19-34 that goes far beyond other treatment centers. Our residents completely overcome their addictions, as well as further their education, receive extensive career training, and adopt healthy new life-styles. They gain all the tools they need for a happy and successful life of sobriety – for life! We live on the Outer Banks of North Carolina and the weather here can sometimes deliver unexpected storms. 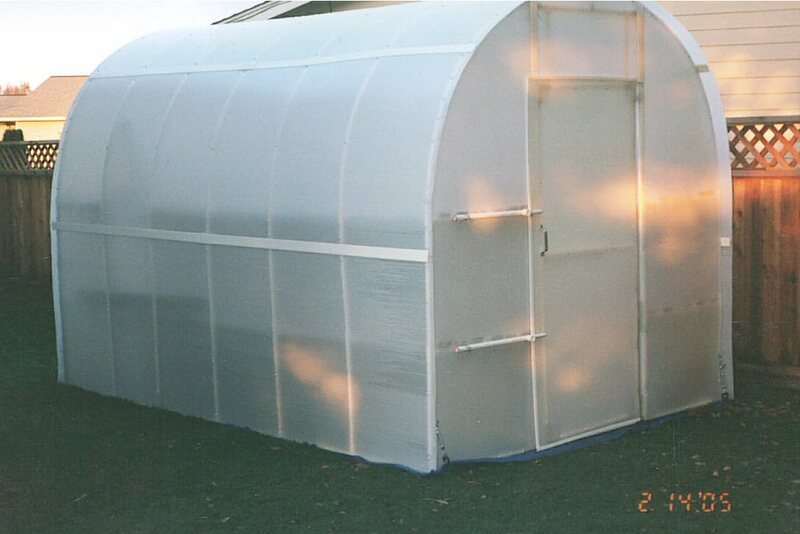 After extensive research of green house coverings I decided on Solexx due to its superior quality. After calling the factory and talking to several employees, especially Bryen, about installation, I knew I had selected the right product and the right people. 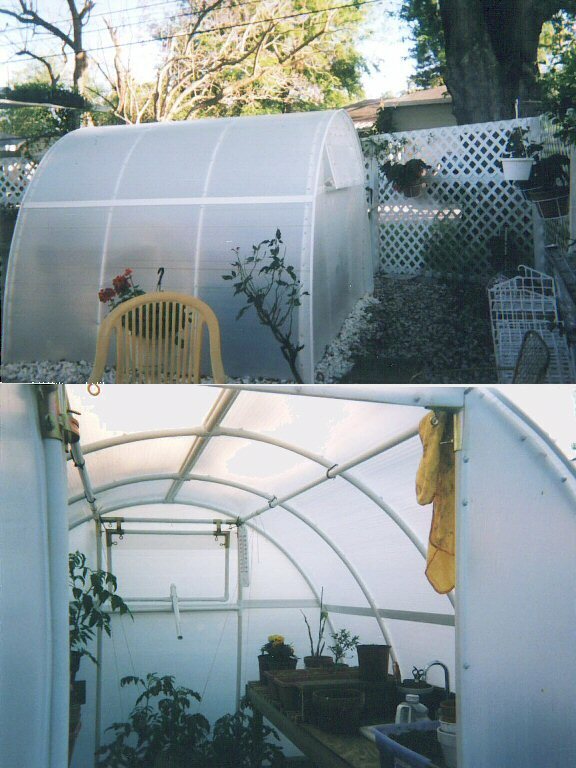 All were extremely knowledgeable and helpful, making the installation of my greenhouse covering an easy and rewarding experience. 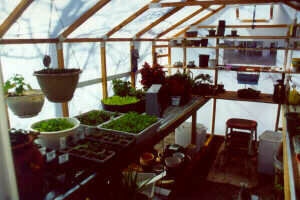 I have also installed water, electricity, two 4’ grow lights, and a solar vent into my green house. 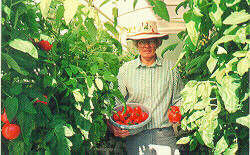 I am very pleased with the end results, and my wife is delighted with “her” new greenhouse. - Tom D., Manteo, NC. 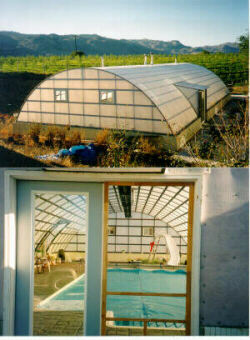 One of our customers sent us this picture to show us how is converting old manufactured homes into greenhouses. Wow, what a whirl-wind happenings yesterday was. Talk about an energy filled group of people. Energy filled, enthusiastic, knowledgeable, and so very definite. WOW! Diana and I came away with tons of remarks, statements and just hours of conversation. God, what where we just apart of. You and your group at Solexx, The Greenhouse Catalog are something. Thank you all for all of your super help, cordial sharing of knowledge, and just fantastic CUSTOMER SERVICE. WOW! Hey, is there such a think as an ASSEMBLY GUIDE? I looked every where on the SOLEXX webpage but couldn't find anything. My reason, like Laurie's husband, I want to read about it before I actually got started. DAH! Geeze, don't share that with Laurie. Her, she'd just open the packages, fit this to this, that to that, and have it up in no time. But people like me, I read before. Shush... HEAR! Again, what a fantastic experience yesterday was. Plus, my buddy, from over the back fence, came over when he saw the lights on. First QUESTION, "what are they like?" I showed him the photos, showed him the sample, and, and. The son-of-a-gun, "that's all the pictures you took?" My reply, "NO, I bought one! It'll be here by the end of next week. Gonna have lots of assembly, lots of things to do!" He said, "you bought one? I thought you were just going up there to look at them?" When I showed him the sample of the material, he went crazy. "What the heck is this?" "Well, Lez, it ain't anything like you Harbor Freight outhouse." And that started us going.... His remark later was, "God this is going to be a GREENHOUSE CASTLE for PLANTS, my plants will be neighbor to PLANTS from THE CASTLE!" I am not Mrs. Bob the Builder but your instructions are so clear and complete that even I can build this greenhouse/woman cave. 8’ Oasis 5 stars. - Lori F. Chehalis, WA. 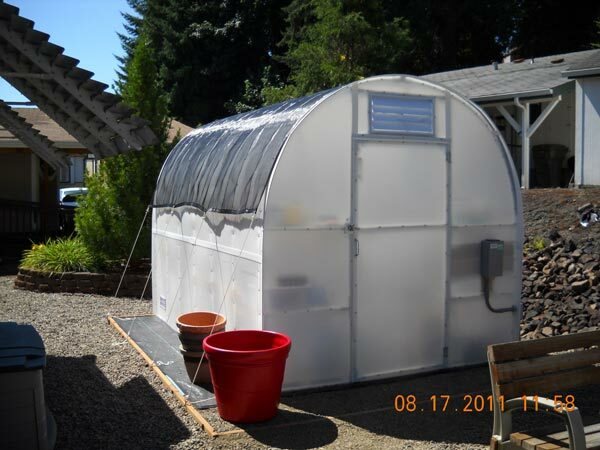 I just love my Solexx 16'x20' greenhouse! 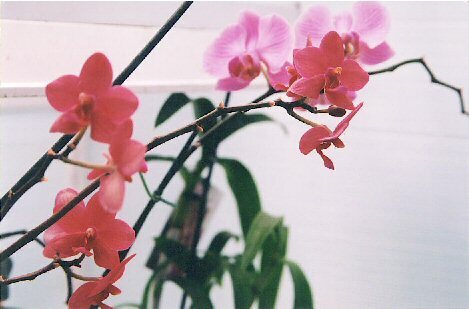 I've been raising orchids for about nine years now, and my Solexx has paid for itself in trouble free maintenance costs. 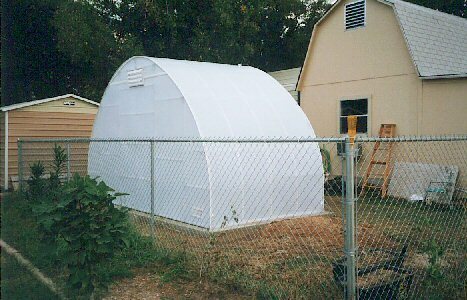 My first greenhouse was made of fiberglass and was a dreary place where I was constantly trying to maintain temperatures, shade and sun conditions, moisture, etc. 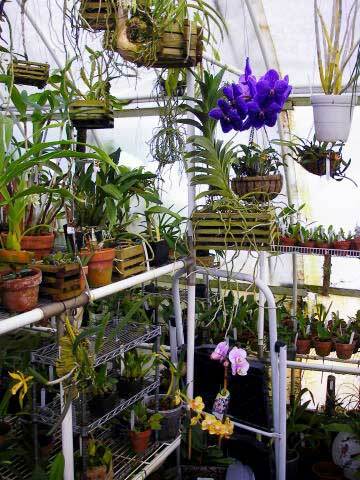 With Solexx I've been able to do everything I needed for the types of orchids I grow -- a very diverse group! I was even told by some 'experts' that I'd never be able to grow so many species in one greenhouse without having separating walls, and yet I've done it in my Solexx. I live at the northern end of the Oregon banana-belt, right along the I-5 corridor, so we get temperature ranges from as low as 19 degrees in the winter, to as high as 111 degrees in the summer (that's Fahrenheit by the way). 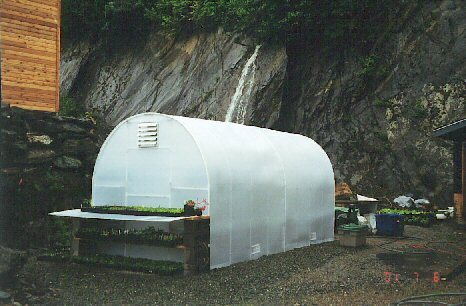 My greenhouse stands right out in the full sun and wind so a shade cloth was added as protection, and a HotDawg natural gas furnace for heat. A dear friend automated it for me with sprinklers and a humidistat misting system under the shelves. Then, we put four inches of pumice on the floor to maintain humidity. Solexx has really come through for me, and I'm sure that others will find that it comes through for them, too! 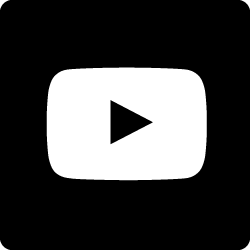 Please feel free to post the pictures on-line. 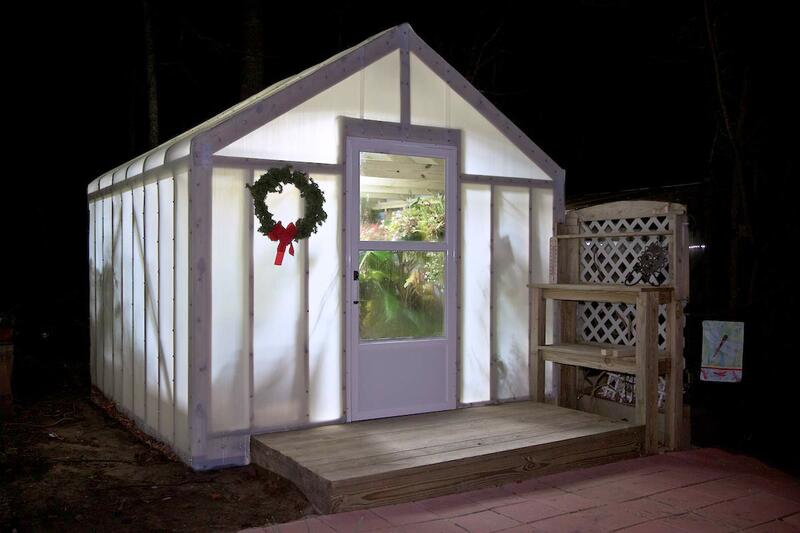 We had fun putting it up (8'x12' Solexx Gardener's Oasis Greenhouse). If you separate the parts and follow the steps, it's really not that difficult. We bought the 16" exhaust fan, which is a must ( I feel ), and I am glad we did. We got a permit and had an electrician install the fan and several electrical outlets. I use T5 lighting and heat mats. I have a kerosene and electric heaters. My neighbors use it for their seedlings too. I LOVE MY SOLEXX GREENHOUSE. Two green thumbs up! We use our Solexx Greenhouse year around. I was really amazed that anything lived through the past winter. It was the coldest and snowiest winter in 25 years -- temperatures were below zero. With only a small ceramic heater, I was able to keep the temperature around 42 degrees. 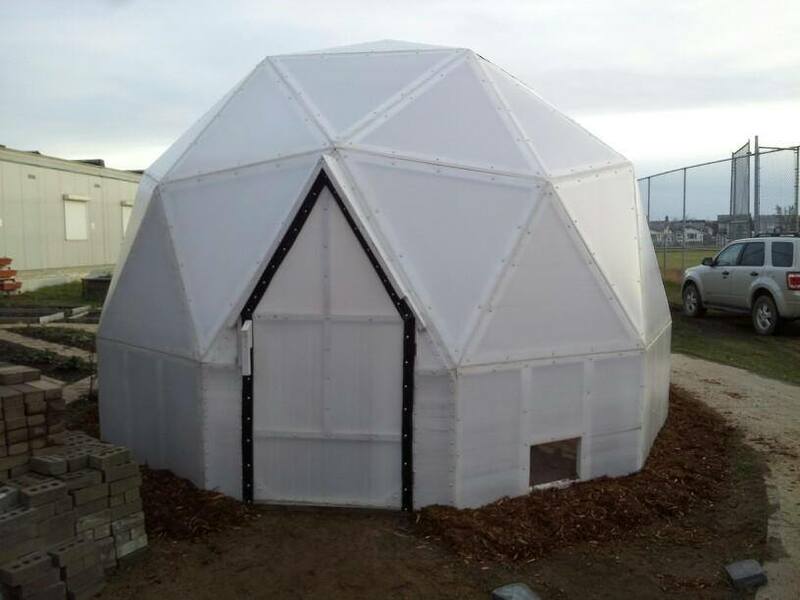 Last Summer we purchased Solexx paneling for our "stick built" greenhouse and the nice sales person asked if I would send to you some pictures of the finished greenhouse. 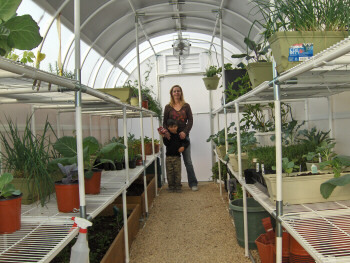 So attached is a picture or two of the finished greenhouse. We decided to garden at waist high levels so we built a concrete stem wall around the perimeter and are gardening in large wooden, pull out doors. Sliding glass doors turned sideways provide the see-through glass at eye level. 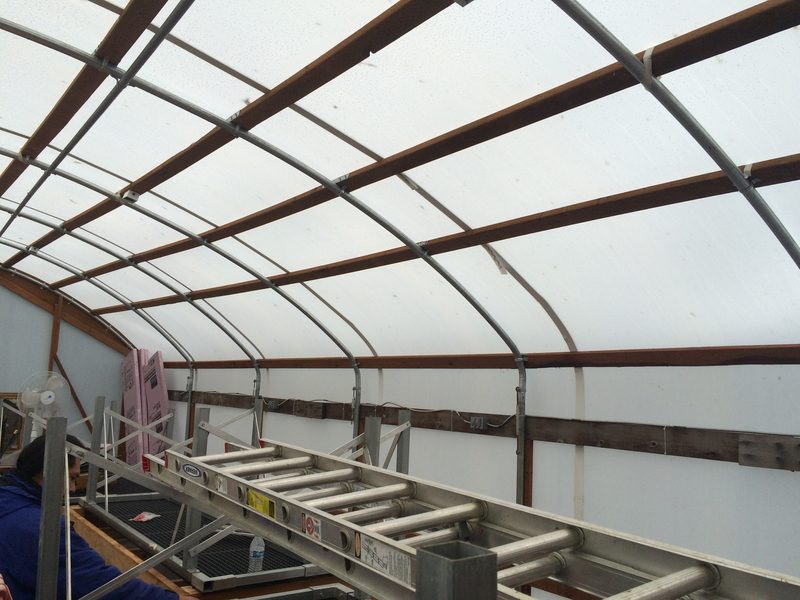 We used the Solexx on the roof and on the West facing gable end of the greenhouse. We was concerned about snow sticking and therefore made a 12:12 pitch on the roof. We live at 4,000 ft and so far (knock on wood) the snow we have already gotten has shed off rather easily. Both my wife and I like the look of clear glass and the Solexx material mixed together. I purchased an 8' x 16' Conservatory Greenhouse a year and a half ago. 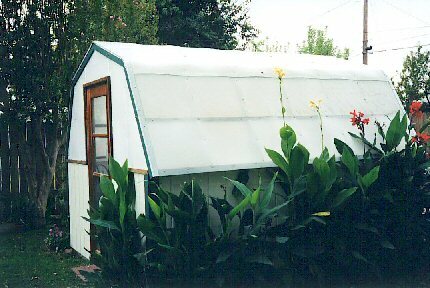 I remember my neighbor telling me how my greenhouse was going to blow away in the next storm. Well, his metal shed blew away...winds were up to 90 miles per hour. Your product has passed the fury of east coast storms. I'm impressed! After 8 years your corrugated plastic has stood up to Houston's 90-degree summer heat very well. Thanks for my beautiful orchids! I am a very old and very happy customer of yours! 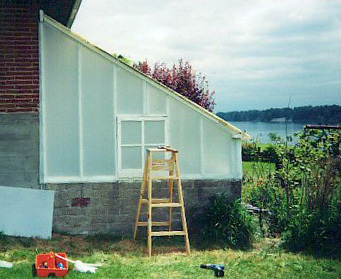 Some 7 to 8 years ago I got some of your fluted glazing and made the best coldframes out of them. They are still going strong today and have held up to the harshest of weather conditions here in upstate New York. 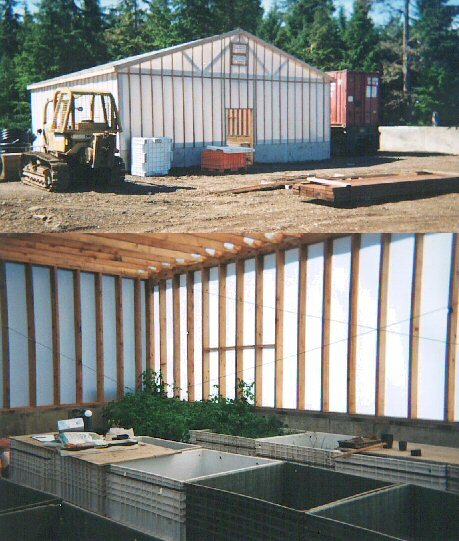 A happy customer in Eastern Washington used Solexx double-walled greenhouse glazing to cover his custom-designed family pool enclosure. The diffused light and humidity from the pool make for an excellent environment for plants and people. I have suffered from Seasonally Affected Depression for as long as I can remember, which is longer than they have had a name for the problem. Every January, I actually used to start canceling appointments, hurrying home from work at night and making plans to hole up at home every evening and weekend all winter long and ride out the darkness until the spring came. 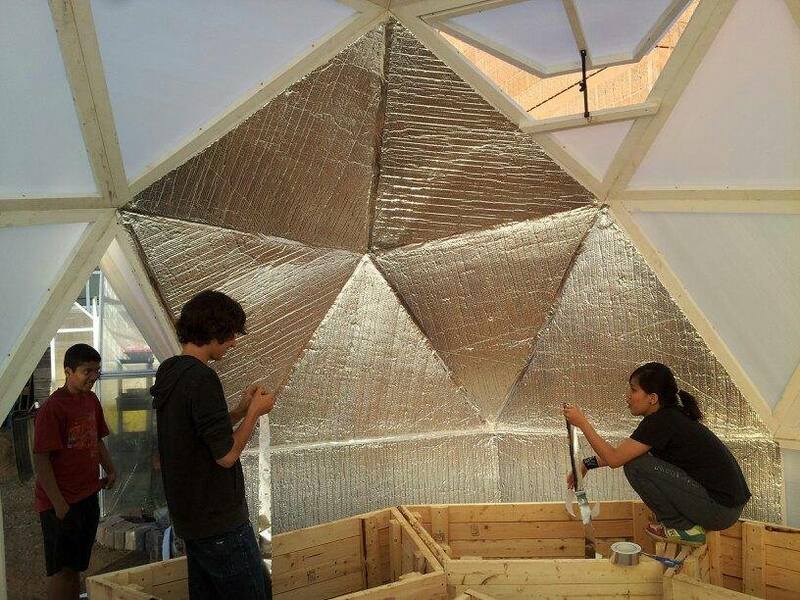 Among the reasons I chose your greenhouse were the insulating and light diffusing qualities of the Solexx covering. I didn't realize however, the affect that this light-spreading quality of the covering would have. 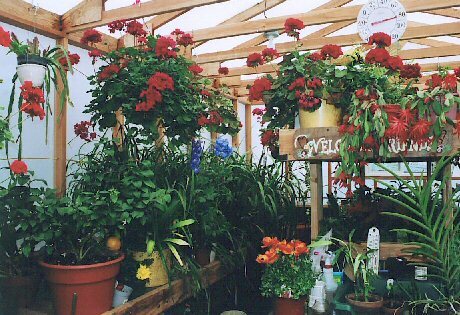 The first winter, I began to spend more and more time in the greenhouse. 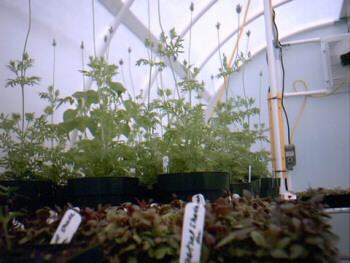 Then, I began to realize that my usual depression was lessened the more I worked in the greenhouse. Since our Pacific Northwest winter weather usually requires fun typhoon regalia to work outside, I had no idea that the available light could be sufficient to lift my spirits. 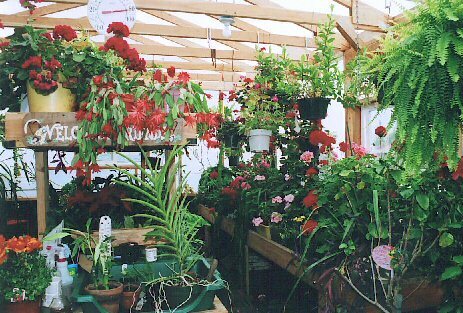 Even on gray days without my overhead lighting on in the greenhouse, the entire inside of the greenhouse seemed to glow, and if you added the additional comfort of the electric heater which more than keeps the greenhouse cozy, well, I wasn't spending much time in my house. 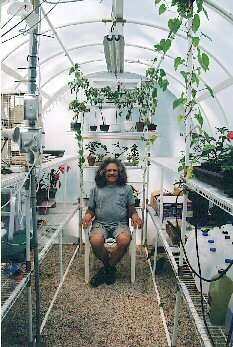 It is much like being inside of a fluorescent light tube-with the curved ceiling of my greenhouse overhead like the curve of the round tube -and seemingly surrounded by soft glowing white light. Update 2016: After 23 years, Jan visited us to replace the two panels on her roof for the first time (they lasted well beyond the 10 year warranty). Otherwise, her greenhouse is still holding up great! Still loving Solexx! September 16th, 1999. 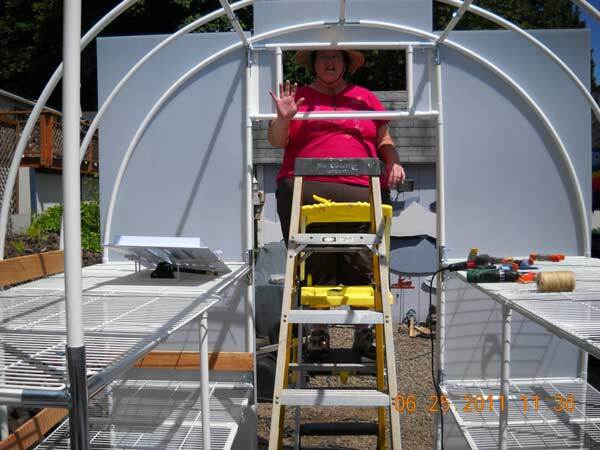 Virginia D. called this morning after Hurricane Floyd battered their area to tell us her greenhouse had come through the storm in Hague, VA. People lost roofs and buildings, as well as trees, so she was pleased to let us know the success she had with the greenhouse. 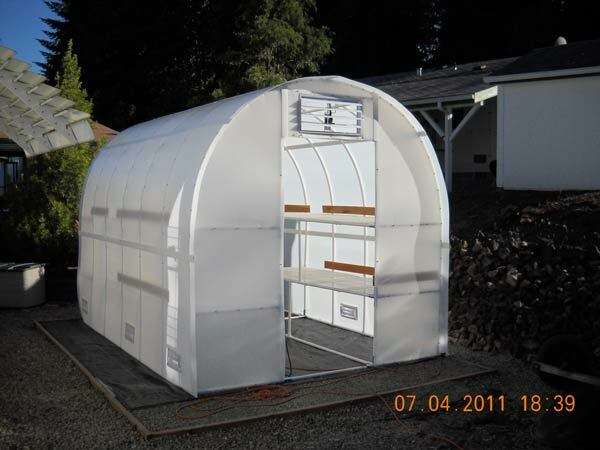 Dear Greenhouse Catalog Persons; THE GREENHOUSE IS UP! It stands straight, tall and proud. So do I. Let me give you a picture. I am a 71-year vintage lady. My sister is close to that. We did it with me worrying and Sister holding. I read - no, STUDIED directions every night then re-read them as we worked. We love it and it will be full of tomatoes by May. 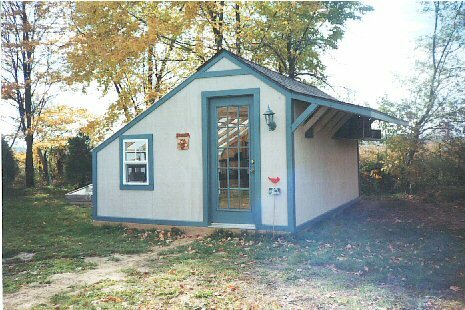 Dear Sirs, In Sept of 2000, I purchased from you a 12' x 8' 7'6" wood Gable GH. I wanted to let you know how much I am enjoying your product and that I have recommended it to several other people...We recently had a wind storm with winds checked at 85 MPH. The greenhouse didn't budge a hair. We also had a snow and ice storm with temperatures of 15 degrees for four days. 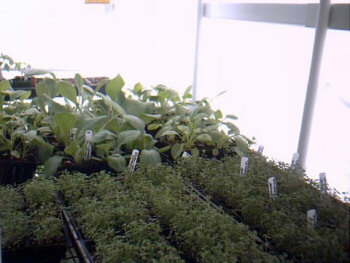 I had a small electric heater with blower inside and the temperature never got below 50 degrees...In addition to moving all of our outdoor plants into the greenhouse for winter, we are enjoying lettuce, radishes, spinach, and a whole hole host of herbs grown this winter. Thanks again for your product and your assistance. Your staff has always been courteous and efficient. Here in Belgrade Montana, it is not uncommon for temperatures to dip below -20 °F for a week or two at a time. Our official hardiness zone is 4, but zone 3 plants survive. Our mean number of continuous frost-free days are less than 85 and the median temperature is about 46 °F. The makes for a very short growing season. 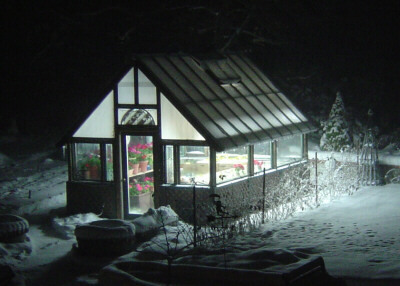 The Greenhouse is heated on a thermostat set at 40 °F. The thermostat is attached to a small Pelonis ceramic heater. This rarely turns on during the day. In fact, on a sunny day, the automatic vents crack open, even when outside temps are only 10 °F! 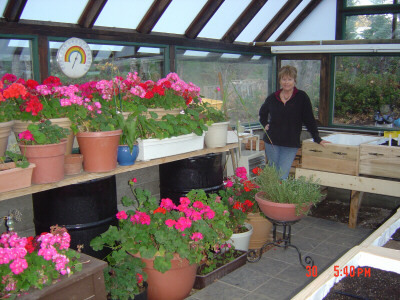 The low cost of heating the greenhouse means that the season can be extended to almost ten months! 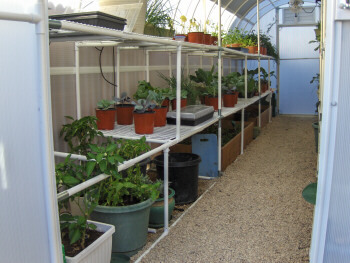 The panels I have purchased from The Greenhouse Catalog make the greenhouse much easier to heat than when it was covered with plastic sheeting. The panels are easy to work with, and very rugged. They transmit high-quality light that the plants really thrive in. The fig bush and grape vine are two years old. Last year, we had about 20 figs. I had never eaten a fresh fig before. 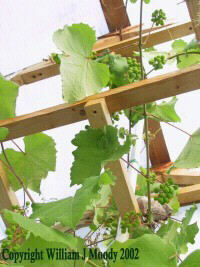 Last year I trained the Himrod grape vine into three main branches. The south-branch is over 17' long! I first noticed the flowers in March. There are almost 50 clusters of grapes this season. The greenhouse is sitting on RR ties and I love it! Have my seedlings started. We have very early frost in fall & late frost in spring. Like right now, it has been below freezing every night lately. I'm 73 years old, so had a neighbor man help me put it up. Took us only 42 hours. 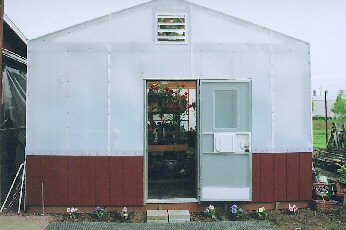 We moved this January and I purchased our second greenhouse, the Garden Oasis, from you. I did 90% of the construction myself. I expected the first greenhouse to last 6-8 years before ultraviolet from the sun deteriorated it, but it appeared as good as the day I bought it - 12 years later. I expect the new one to do as well. 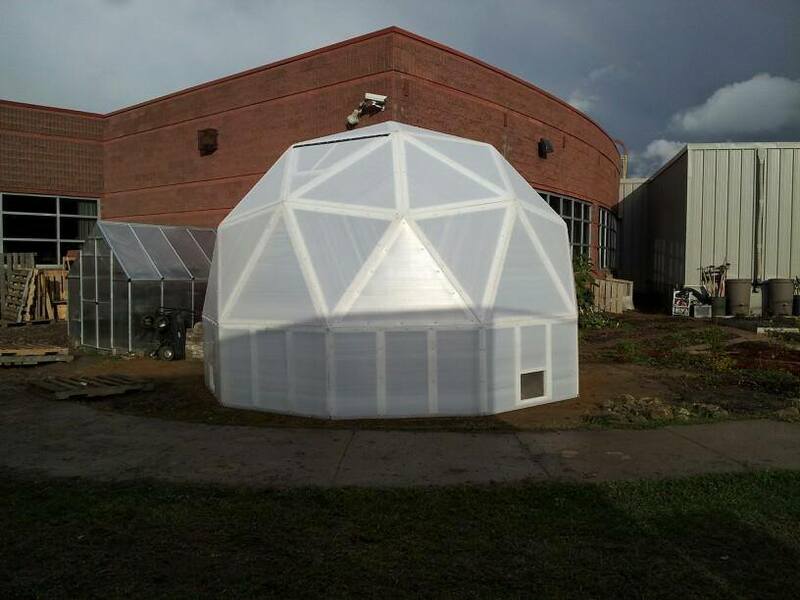 The greenhouse is up! We have already have had 3 tomatoes from it. It is already bursting at the seams. We really enjoy it very much and have many compliments from our neighbors. I have to say when I opened the boxes I was tempted to send them back, but it was a challenge. The secret was to read carefully and with patience. I'm glad now that I went through with it. I made my own benches, put in a sink and had a friend hookup electricity for it. I'm proud to say it really makes the yard stand out. Enclosed are a few pictures - if you can, send me a few catalogs for friends. 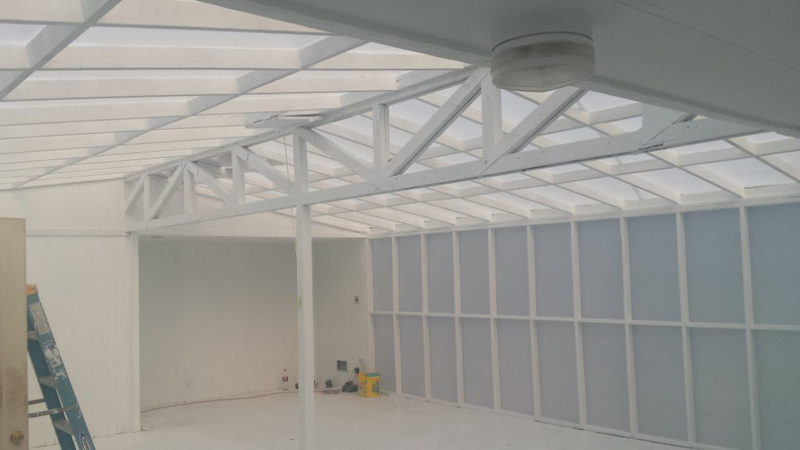 Wood structure covered with Solexx panels. 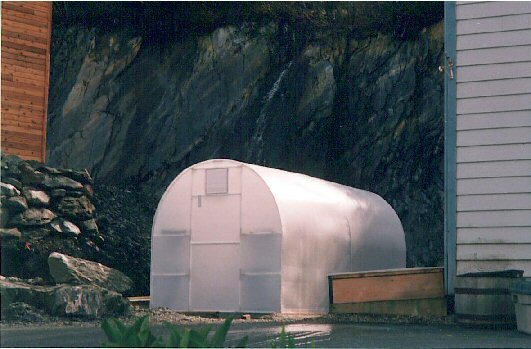 Sent by customer Don T.
16' Gardener's Oasis in an Alaskan setting. Me and my plants really like the Solexx twin wall panels. With the light being diffused through the panels the plants don't burn and they grow very well anywhere in the greenhouse. 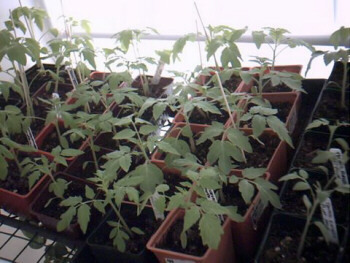 They also work very well for growing seeds and cuttings. 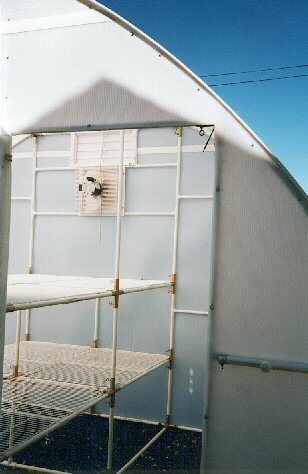 The twin walled diffused panels are the way to go in greenhouse growing and the culture of plants. Great Product! 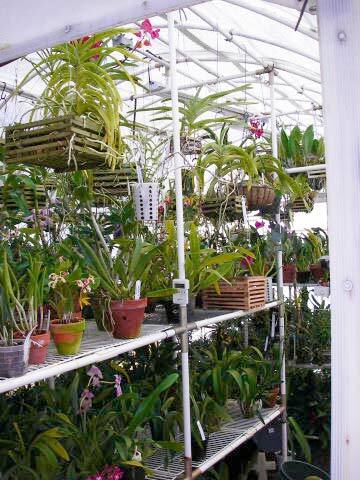 They also give you a sense of coziness and a different world when inside the greenhouse. I really like the way the panels look now that the project is complete and ease of installation. Here's my little greenhouse! 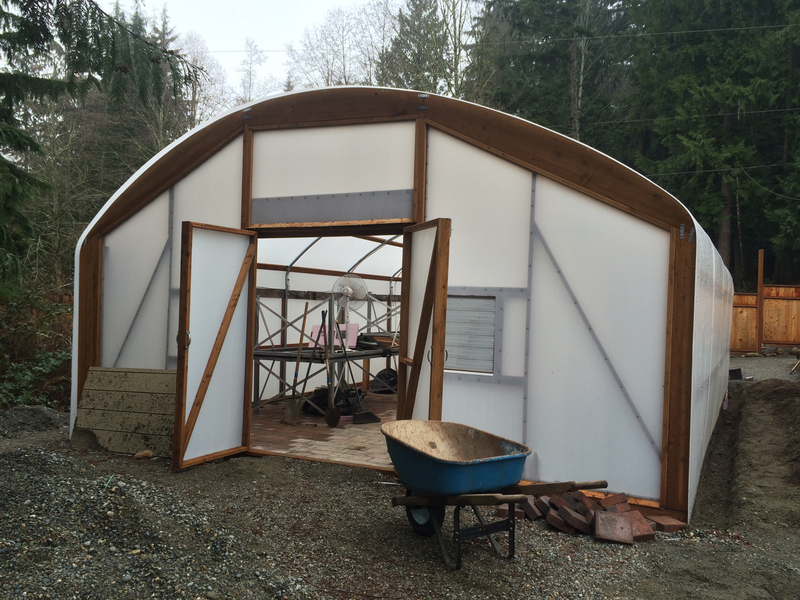 It's a modification of a "pre fab" or kit shed (if we did it over we'd invest in better wood). We are very happy with your products and we are enjoying our new space. Can't wait to start my veggie seeds! 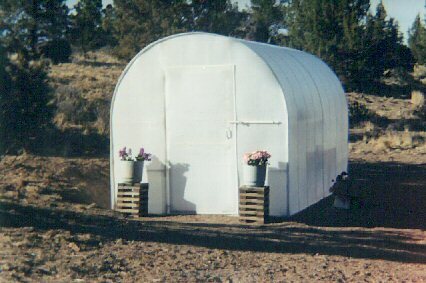 I've always wanted a greenhouse - when I saw Solexx I knew I had found "THE" greenhouse. Thank you! 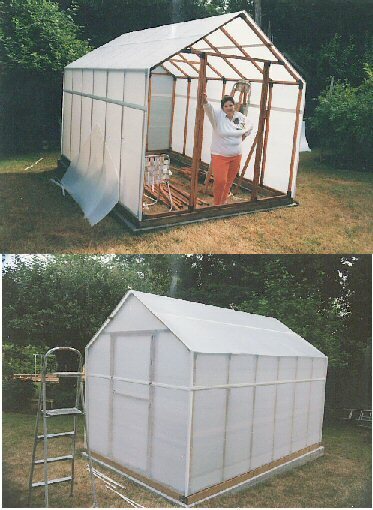 When we finished this greenhouse I thought I would have plenty of room for starting vegetable and flower seeds, but one flat lead to another one and so on so now we are adding on an 8 ft. extension. I hope that will be enough! 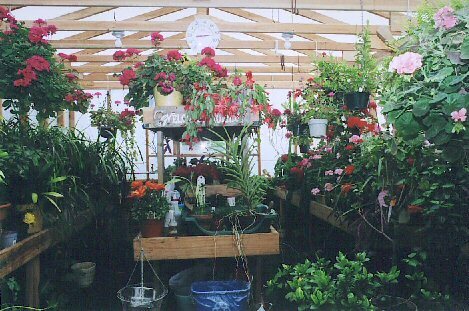 My greenhouse is over 10 years old and it is full of plants. I keep a small heater with low heat, I kept all last years plants, did not have to buy them over. Love my greenhouse! This was our 50th Anniversary gift, from money gifts. Thanks to your helpers, they moved it for me to my new residence. Oh! Beautiful! Better than brand new! I have enjoyed assembling the 8' x 8' x 7' Garden Master kit, and appreciate your help. I am especially appreciative of the excellence of your assembly instructions. They are clear and well illustrated. Thought you might appreciate these photos of our recently completed greenhouse. Our adult erector set was built in 3 1/2 days, one supervisor and two workers. We did not have any major problems and consequently only one or two minor mistakes. We are quite pleased with the end product and believe we were successful in the endeavor. 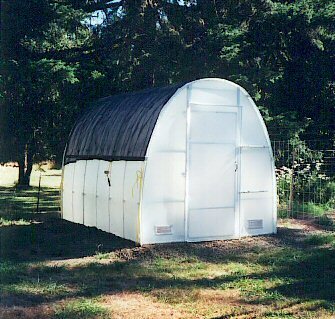 Enclosed are photos of the greenhouse I bought from you a month and a half ago. I put it on top of our detached garage that has a very low-pitched gable roof. 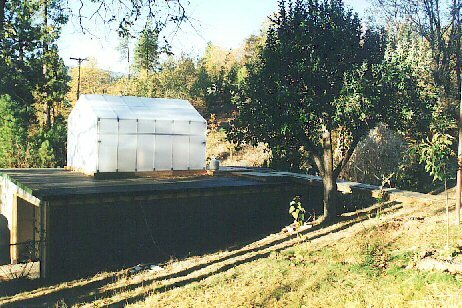 The greenhouse sits on top of a cedar deck and we access it via a ramp, which you can see on the right side of the photo. We chose this location because it gets a good amount of sun and our property does not have much level ground. 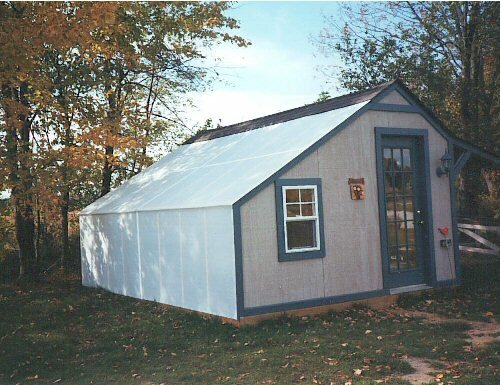 Plus we think the greenhouse makes the garage look a bit more interesting. 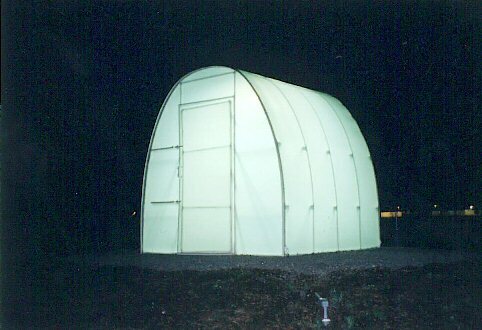 We wanted you to have a picture of our completed greenhouse. We have really enjoyed it. Your helpful, non-pressuring salespeople made me decide to purchase your greenhouse kit. These wonderful pictures were shared with us on May 30th, 2007. 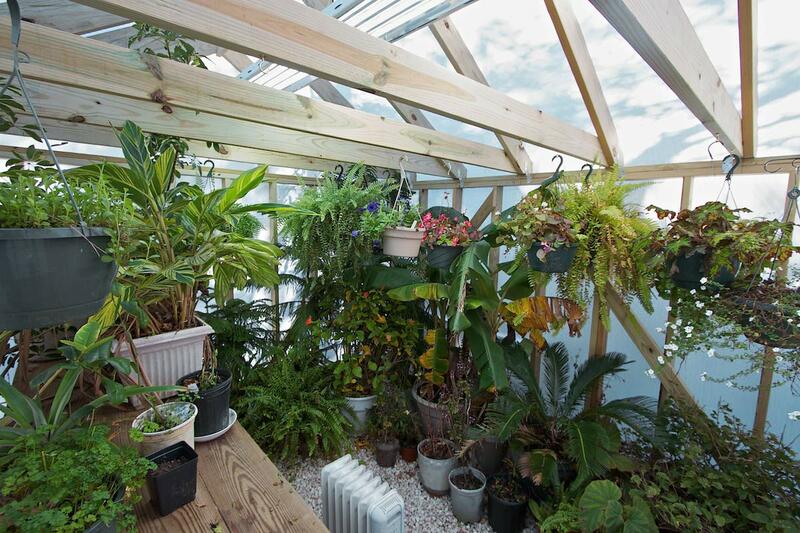 The Swongers' custom built their greenhouse and covered it with Solexx glazing, and the results are amazing! Foliage and blooms cover every inch of the interior of the green house - a true masterpiece! 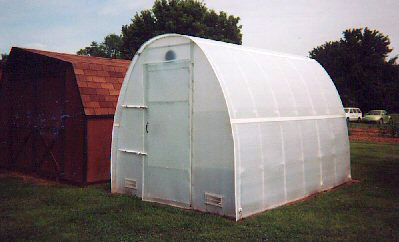 Before we purchased our Oasis Greenhouse we had looked at many styles & models from other companies. 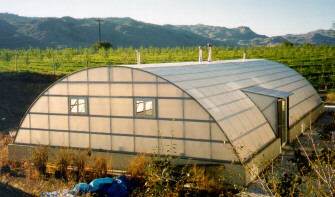 Our reasons for choosing Solexx was based on the strength of the structure, the paneling the incredible amount of room that this greenhouse has and great customer service. Our greenhouse kit arrived in 2 days and went up quite easily. When it was completed and we stepped inside we knew that we made the perfect choice. Thank you Solexx ! 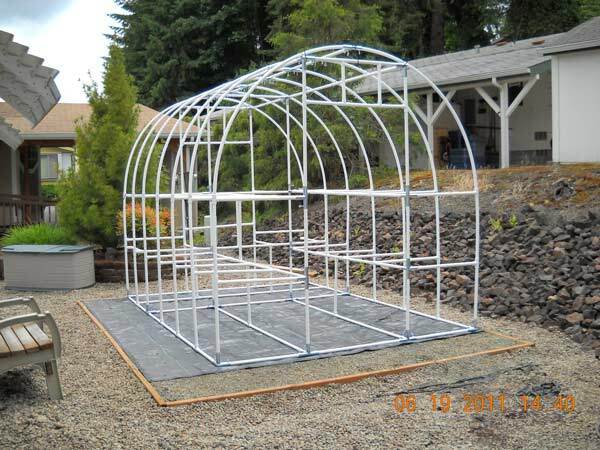 Just wanted to drop quick note to thank both of you for being so helpful and knowledgeable with my (Oasis 24') greenhouse purchase/assembly. I got it all built all by myself. 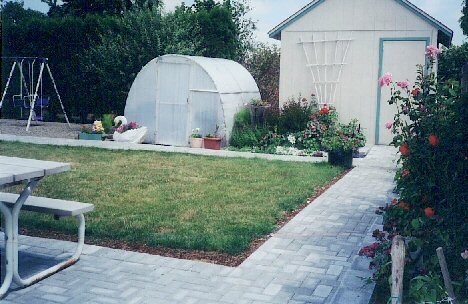 We just love our new garden; we live in the high desert of California where we have up to 115 degree daytime highs and lows @ 38 degrees at night, with constant daily high winds. With the Oasis our garden has a more steady temperature (85-51 degrees) and the leaves are not torn away from the daily winds. Also I am excited to actually be able to eat more of the fruits of our labor, since growing our bell peppers, cabbage and broccoli inside, it will not be decimated by the hundreds of cabbage loppers, tomato worms (yuck). We grow organically and my son loves the hundreds of butterflies that overtake the garden every summer. I am glad I opted for the solar opener sure is worth the cost, it works perfectly. And the wire shelves, TONS of room for LOTS of plants!!! And as you can see from attached pictures we still have tons of room for more plants!! 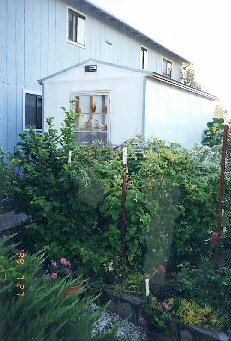 I have included some pictures of our Greenhouse, which by the way is in a 10' x 40' area on an unused portion of a back side yard. 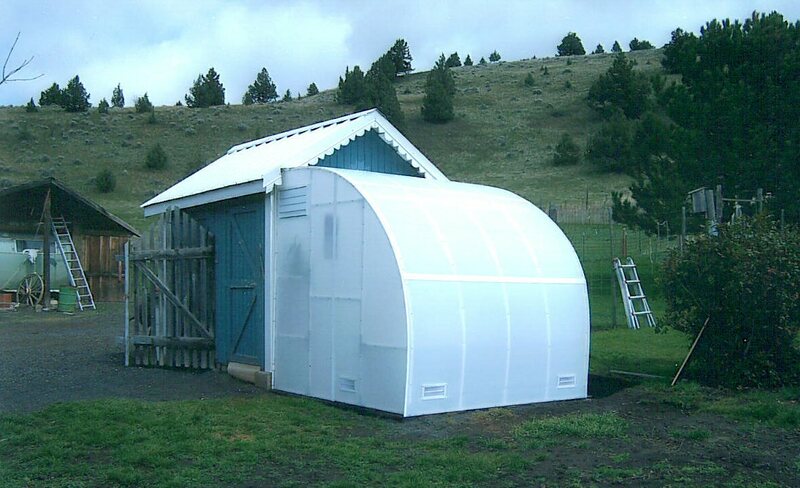 So you really can put a greenhouse anywhere!